Frankfurt 2009: Porsche | What Car? The Panamera four-door is big news at the Porsche stand, but there are also three new versions of the iconic 911. If the standard 911 just isnt quick enough for you, there are three high-performance versions on show at Frankfurt. First, theres the updated 911 Turbo, which now has a 3.8-litre engine, rather than a 3.6-litre, and has a monumental 493bhp (and not the weedy 473bhp of its forebear). The main consequence of this, of course, is that the new Turbo is even quicker than before, and not just by a little bit. Look up the 0-60mph time of the previous car on your supercar wallchart and youll see the new Turbo is half a second quicker at just 3.4sec. Top speed is up from 192mph to 194mph. Perhaps the most remarkable figure of all is the fuel consumption which, despite all of this insanity, is up to 24.8mpg on average. We put a 911 through a real-world fuel consumption test recently here and found that it came the closest of almost any car to its official figure. Options include Porsche Torque Vectoring, a stability control system that seemingly bends space-time to make the Turbo even faster along twisty roads. The new 911 Turbo is 101,823 for the coupe and 109,048 for the convertible. The 911 GT3 RS is more than just hairy-chested, its got hairs on the back of its eyelids. The supercar is used for homologating the racing version of the 911 GT3. What does that mean? It means its the nuttiest Porsche you can get for the road. The 444bhp non-turbo engine might be down on power compared with a Turbos, but the GT3 RS is lighter, stiffer and meaner. Options for the truly weight-obsessed include a li-ion battery replacement for the lead-acid job, saving 10kg. 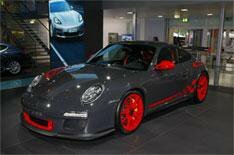 The GT3 RS will set you back a Turbo-rivalling 100,760. Oh yes. Porsche also has a new, retro-inspired 911 at Frankfurt. The Sport Classic special edition is based on the 911 Carerra S, but has a number of visual and mechanical tweaks to make it quicker, sportier and more exclusive. Just 250 of the cars will be built and, as the name suggests, the 911 Sport Classic takes its styling cues from 911s of the past, with details such as retro alloy wheels and a spoiler similar to the one on the 1973 Carrera RS 2.7. Other changes include a revised front spoiler, side sills and black-rimmed bi-xenon headlights inspired by racing cars such as the 1974 911 Turbo RSR. There's also a dip in the centre section of the roof that creates a 'double-dome' effect in deference to the Carrera GT. Sport Classic Grey is the only colour option, with two darker grey stripes running across the top of the car. The interior has woven leather on the sports seats and door linings, while the dashboard is also trimmed in leather. Motifs near the glovebox and on the door sills display the number of each car within the 250-model production run. The 911 Sport Classic is powered by the 3.8-litre flat-six engine from the 911 Carrera S, but its power is up from 380bhp to 402bhp thanks to a new intake system and cylinder heads, plus engine management tweaks. A six-speed manual gearbox is standard and Porsche quotes a 0-62mph time of 4.6 seconds and a top speed of 187mph. The car, which has been lowered by 20mm over the standard version, comes with Porsche's Sport Chrono Package Plus, as well as the company's Active Suspension Management and uprated brakes. A BOSE stereo, Alcantara headlining and a vehicle-tracking system also come as standard. The 911 Sport Classic goes on sale in the UK in January 2010, with prices starting at 140,049. Performance 911 fans are spoilt for choice.